Some people don't understand the difference between a haircut and a style. The haircut is only intended to maintain the current style; that is, keeping it trimmed to the proper length. A haircut is required only as often as you feel is appropriate to keep you looking clean, neat and looking your best...generally every three to four weeks for most people. Styling starts with a shampoo to clean the hair, removing old product and allows the hair to reveal its natural set. The barber will then be able to see the natural growth pattern of your hair and decide the proper technique to use when cutting your hair. This may be some combination of shears, over-comb, clipper, razor cut, thinning, texturize, etc. Once properly cut, your barber will then use the appropriate styling product(s), blow dry your hair, finish the style to your approval. Your barber will then recommend any products that will help you maintain a healthy and easy to maintain look that others will notice as a part of your unique look. The style is certainly appropriate for your first visit to a new barber. Although it takes a little more time and is slightly more expensive, it will allows your barber to cut your hair properly for your best look. Many clients have their hair styled on each visit just so they will always look their very best and they appreciate the extra attention. 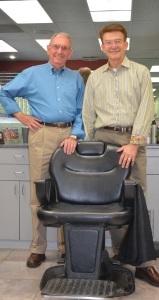 Whether it is a haircut or a style, you will always feel and look your very best at Dakotas.